Posted on November 30, 2012 by Dayna B. 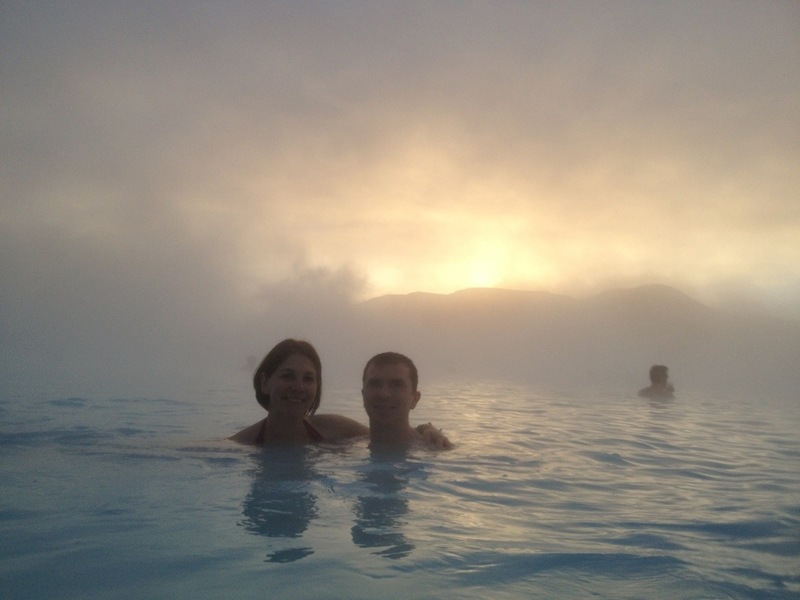 Our final stop in Iceland was the Blue Lagoon. 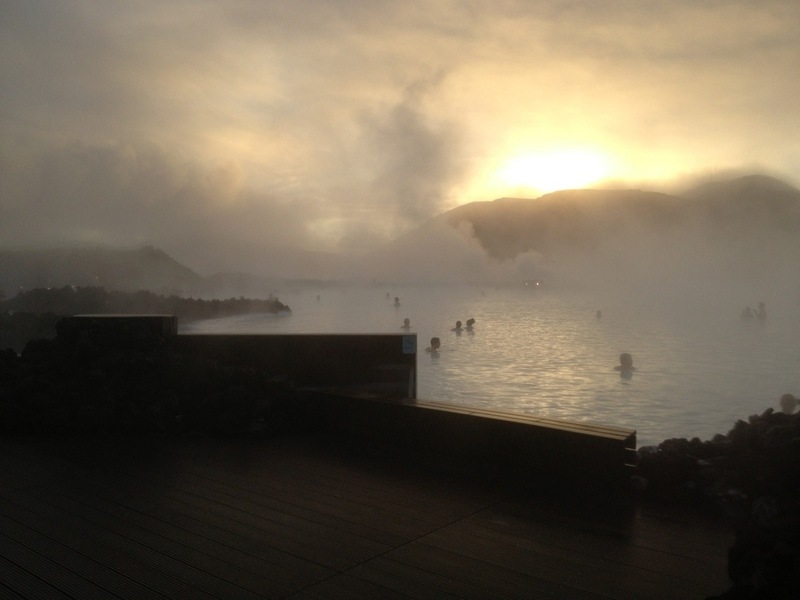 This geothermal spa is one of the most visited attractions in Iceland and it is conveniently located about 20 minutes from the Keflavik International Airport. Our plan was to spend the morning and early afternoon at the Blue Lagoon and then be thoroughly relaxed throughout our flight home. It was a really good plan. I only wish that we had more time to spend there. It was absolute heaven! 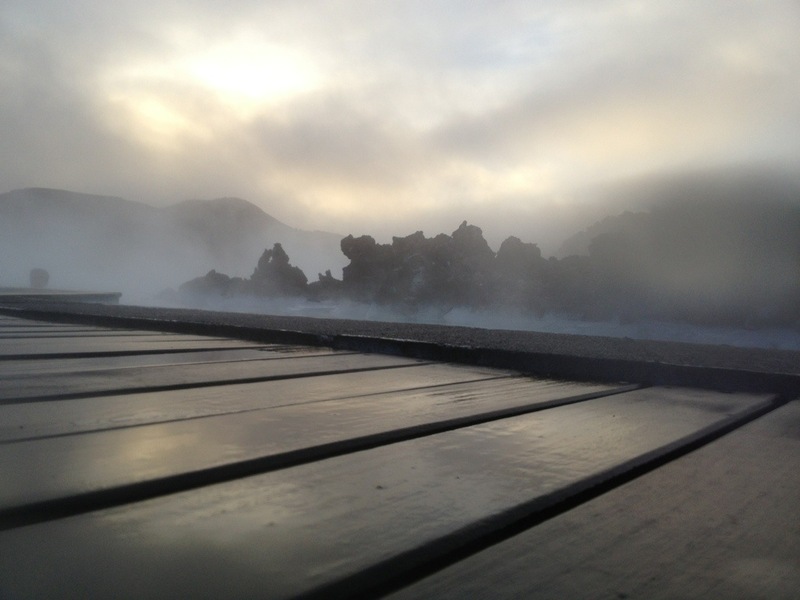 The Blue Lagoon is located in a lava field in Grindavik and the warm water is rich in minerals that are supposed to do wonders for your skin. I must say, my skin did feel fabulous! 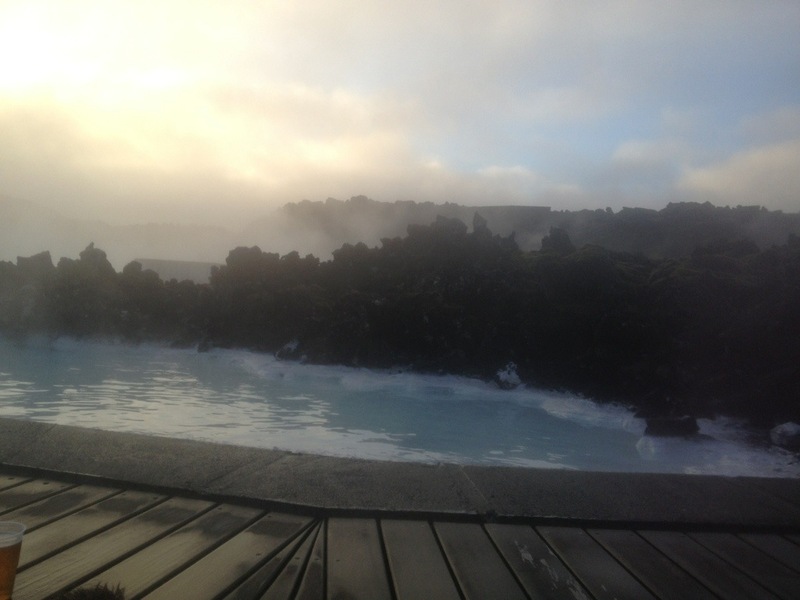 The water is a milky blue color and it leaves a white ceramic-like finish on the surrounding lava rock. If you look closely at the pictures below, you can see the white residue on the lava rock near the water line. Rob is not much of a “spa” guy, but he pretended to enjoy it as much as I did. 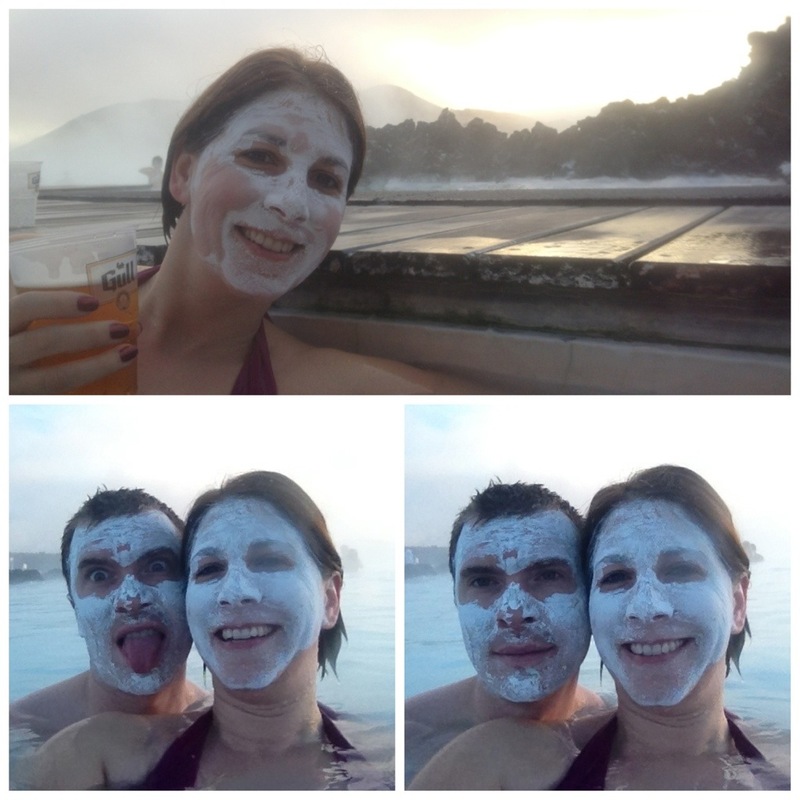 He even joined me in applying an algae moisturizing facial mask! After our Golden Circle excursion, it was time to check out Iceland’s oldest brewery. 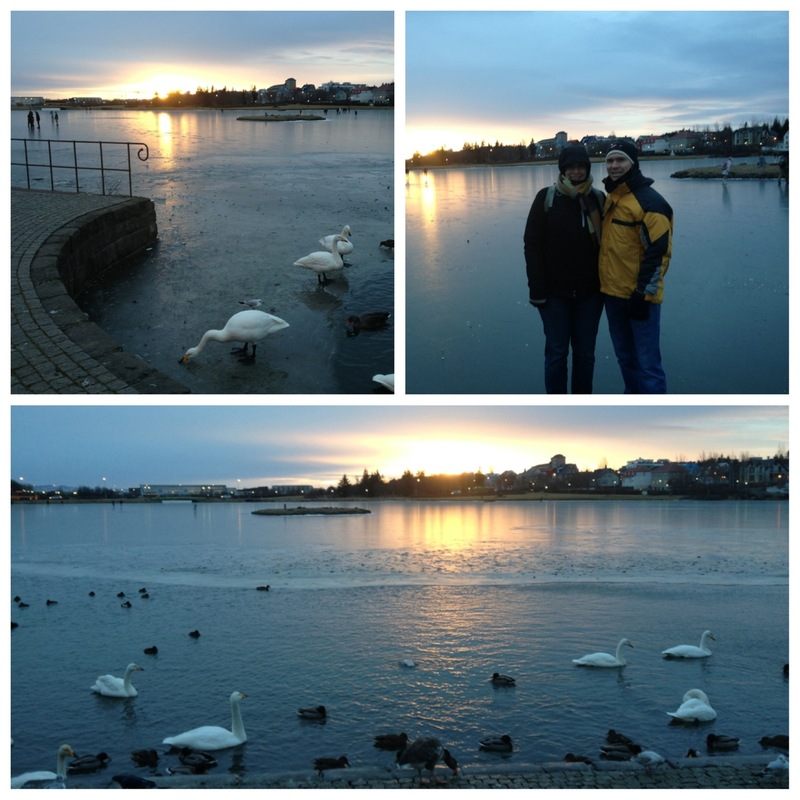 Our friends Patrick and Heather stumbled on this little gem and it was one of the best deals in Iceland. 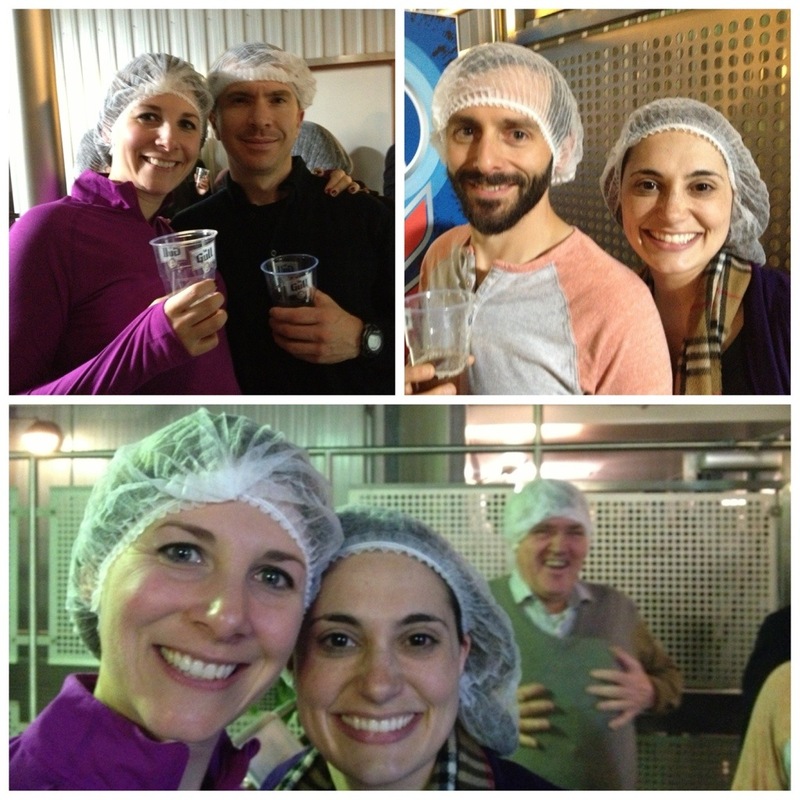 We went to Ölgerðin Brewery for their Taste the Saga tour. 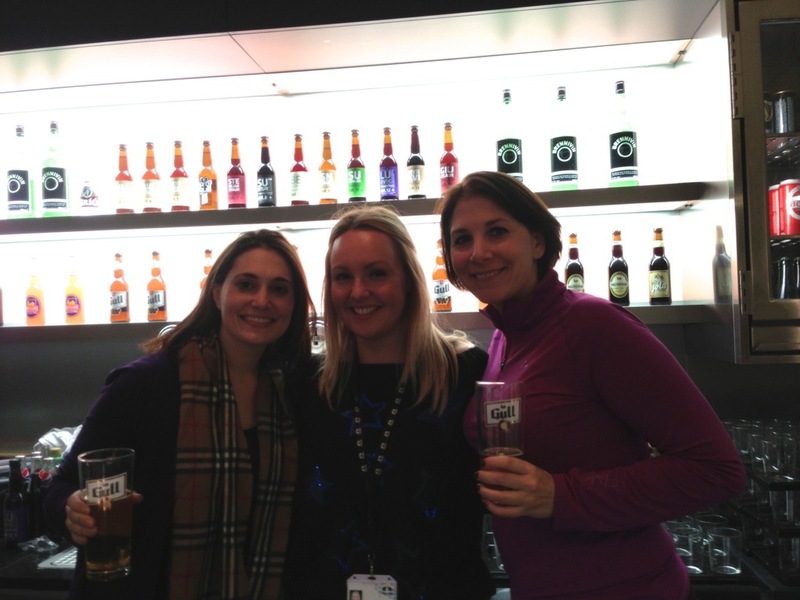 It is safe to say that this booze tour was the best one I have ever experienced! First of all, you really get your money’s worth (and then some!) of beer. Secondly, Iceland actually has an incredibly interesting history when it comes to alcohol. We gathered in the Ölgerðin tasting room and our tour guide, Olof, started the crowd off with a pint of Gull, Iceland’s most popular beer. 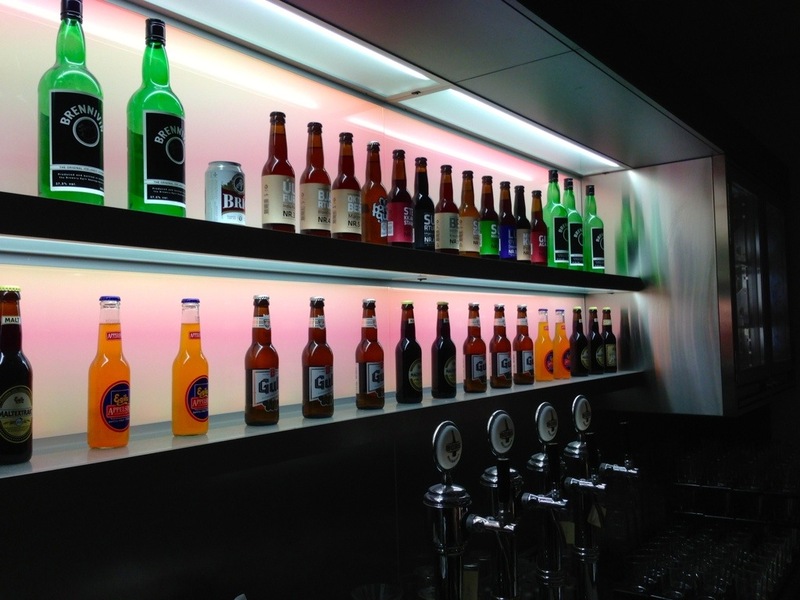 As part of this tour, the Gull on tap was “all you can drink” and as it turns out…we can drink a lot! While the crowd was quenching their thirst, Olof told us all about Iceland’s interesting history as it relates to booze. In 1908, the people of Iceland actually voted to ban all alcohol. The ban went into effect in 1915 and to some extent, lasted until 1989! Spain threatened a trade embargo after Iceland stopped importing their Spanish wine. The threat of Spain no longer importing Icelandic fish was enough for the government to legalize Spanish wine in 1921 (wine from all other countries remained illegal). Then in 1935, Iceland legalized all spirits, but beer remained illegal. This probably sounds a bit backwards, but the thought was that since beer is cheaper than hard liquor, people would be more likely to abuse the cheaper substance. In truth, the Icelandic people just found an alternative way to abuse beer (and I don’t use the term “abuse” lightly!). 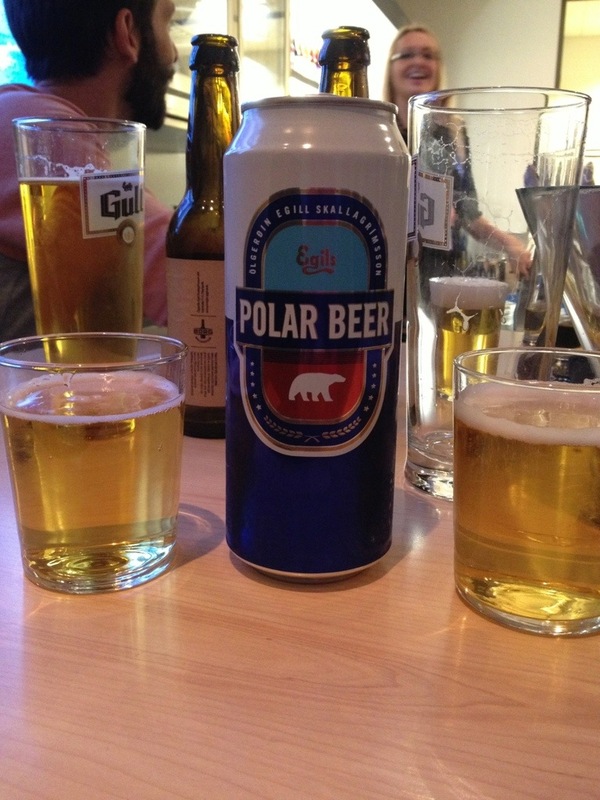 In Iceland, the term “pilsner” refers to their potent imitation beer. Olof prepared a sample of “pilsner” for us to try. She combined non-alcoholic beer with vodka and schnapps (specifically a kind of schnapps the Icelanders refer to as Black Death). I can assure you that it did not taste anything like the pilsner you may be accustomed to. During the prohibition, Iceland still made beer, but it had to be “exported.” Polar Beer was the export product, but Olof led us to believe that it technically never left the country. Instead, it was consumed by Brits on their military installation whilst they were occupying the country. In 1985, prohibition lost more support after the government made it illegal for pubs to add alcohol to non-alcoholic beer to make “pilsner.” Finally, on March 1, 1989, Iceland’s prohibition ended completely. Beer is now the most popular alcoholic beverage in Iceland and many natives celebrate Beer Day on March 1st every year. 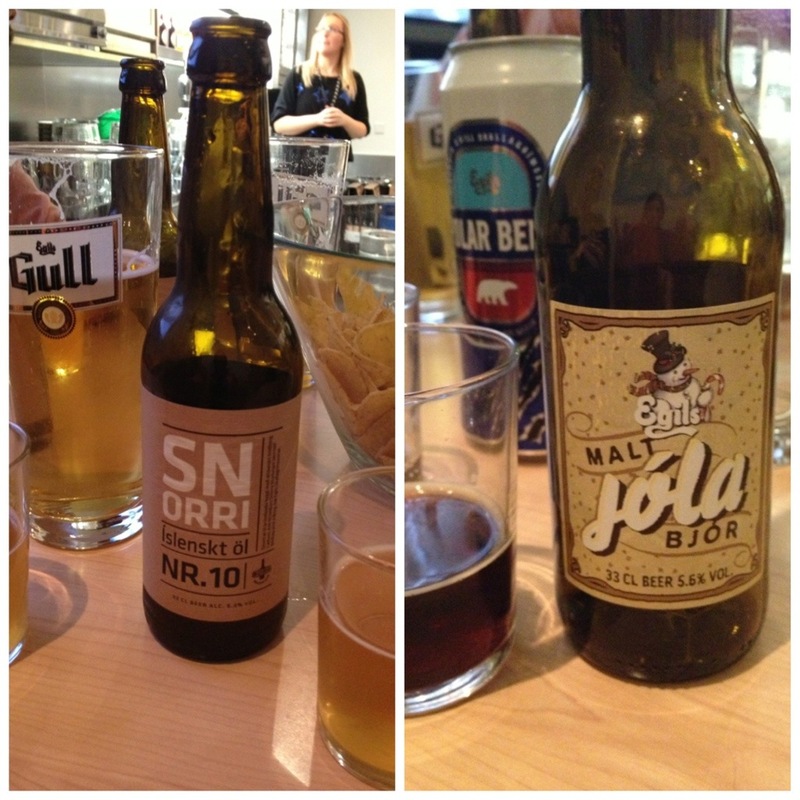 After our tour, we tried several other Icelandic beers. Iceland has to import most of their barley in order to make beer, but we tried a beer called Snorri that was made from 100% Icelandic barley. It was quite tasty and it is the only beer in Iceland that is made only from Icelandic barley. We also tried a Christmas malt that was quite good. Finally, we got a sample of Brennivin (a.k.a. Black Death) which is a caraway flavored schnapps and considered Iceland’s signature drink. Sadly, our tour ended shortly thereafter. 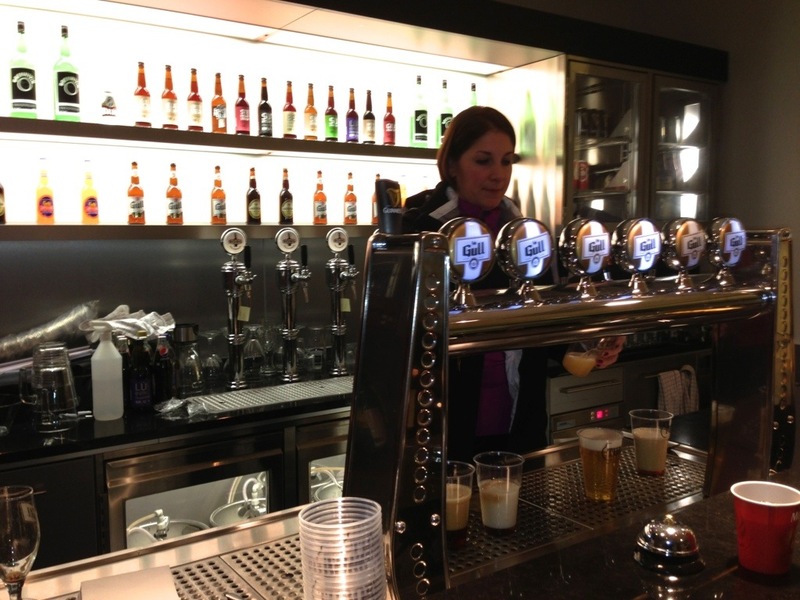 However, Olof let me go behind the bar to pour to-go cups! 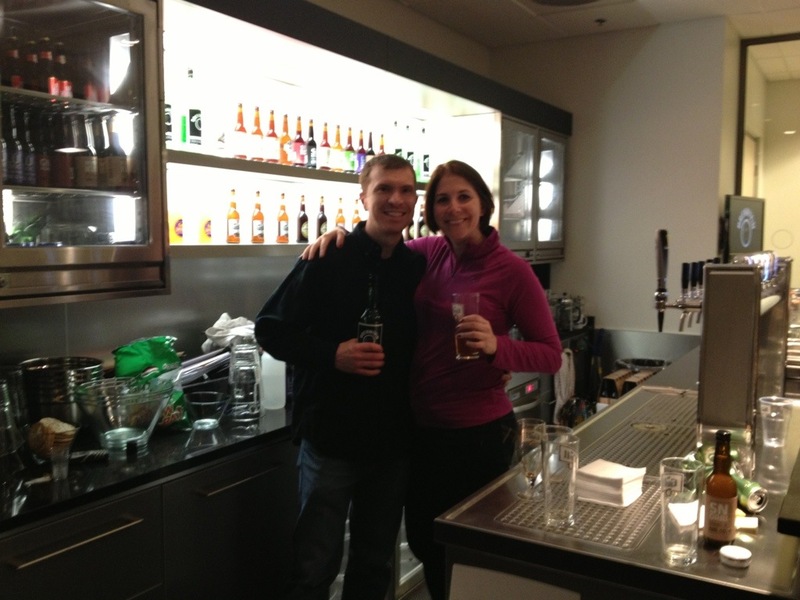 BEST BREWERY TOUR EVER!! To say we got our money’s worth is an understatement. I may or may not have started dancing behind the bar, spun some weird Icelandic wheel of fortune, and possibly a few other things that Rob pleaded with me not to add to the blog! Posted on November 29, 2012 by Dayna B. 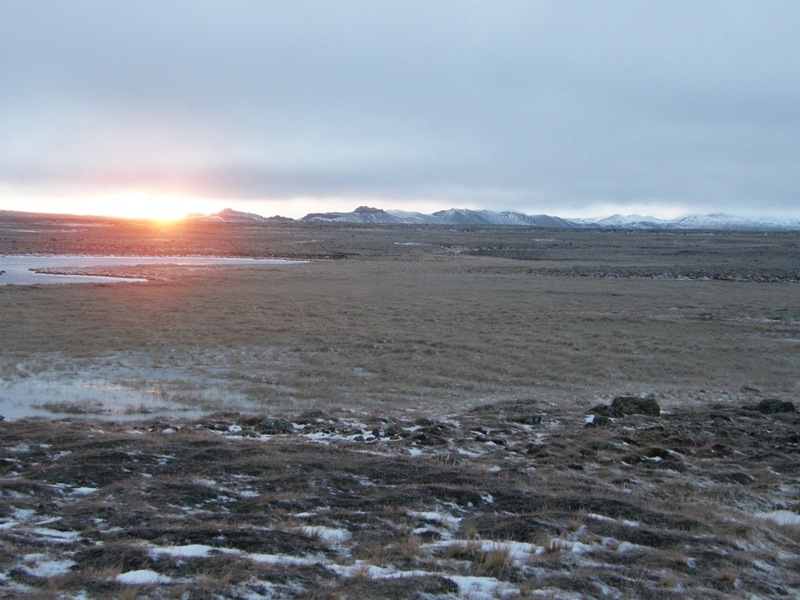 The Golden Circle is one of Iceland’s most popular tourist attractions. Tourists can drive this loop from Reykjavik into central Iceland and back or they can pay for a guided tour and travel by bus. Since we already had a rental car, we opted to drive ourselves, as this was both cheaper and allowed us more flexibility with our sight-seeing. The three main stops along the Golden Circle are Thingvellir National Park, Gullfoss, and the geothermally active valley of Haukadalur. 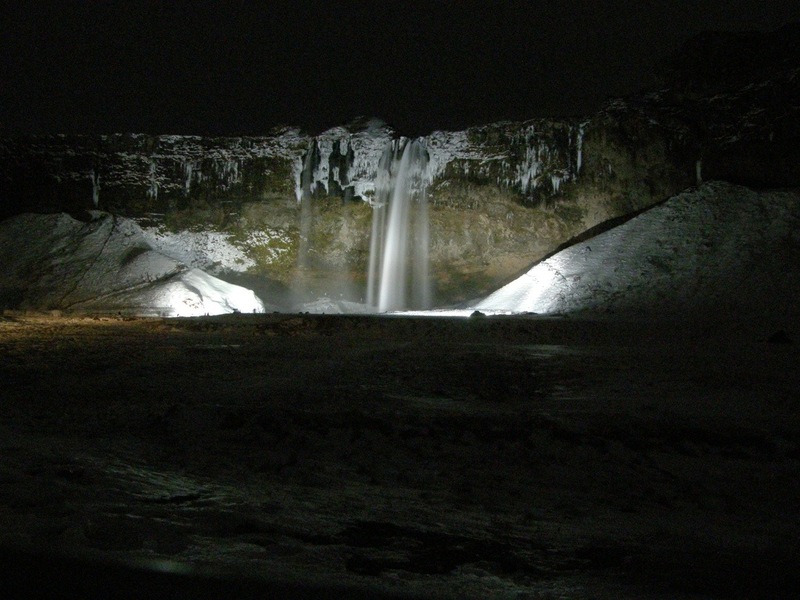 During the winter, the days are very short in Iceland. We stopped along our route to take pictures of the sunrise. These pictures were taken at 10:30 a.m. and the sun goes down at about 4:30 p.m. These few hours of daylight will continue to decrease into the colder winter months. Throughout Iceland, you will find the beautiful Icelandic horse. This hardy horse gets a thick and furry winter coat and is also known to change its color. 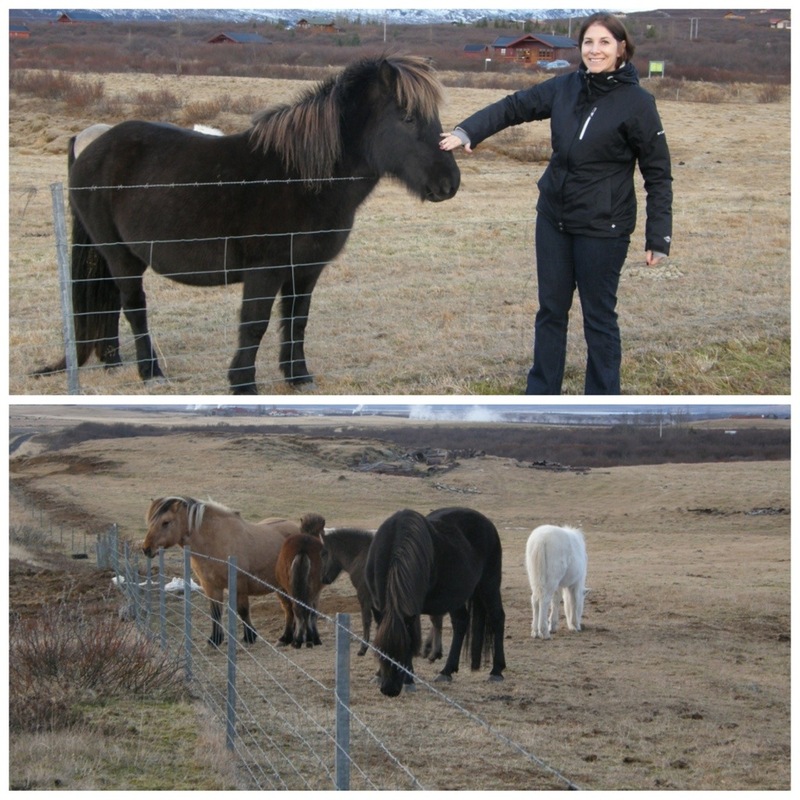 Our glacier tour guide, Anna, mentioned that the Icelandic horse has more color variations than any other horse breed. Another notable difference is that most other horse breeds only have three gaits, but the Icelandic breed has five gaits. The Icelandic horse is the only breed of horse in Iceland and they do not allow other breeds to be imported. 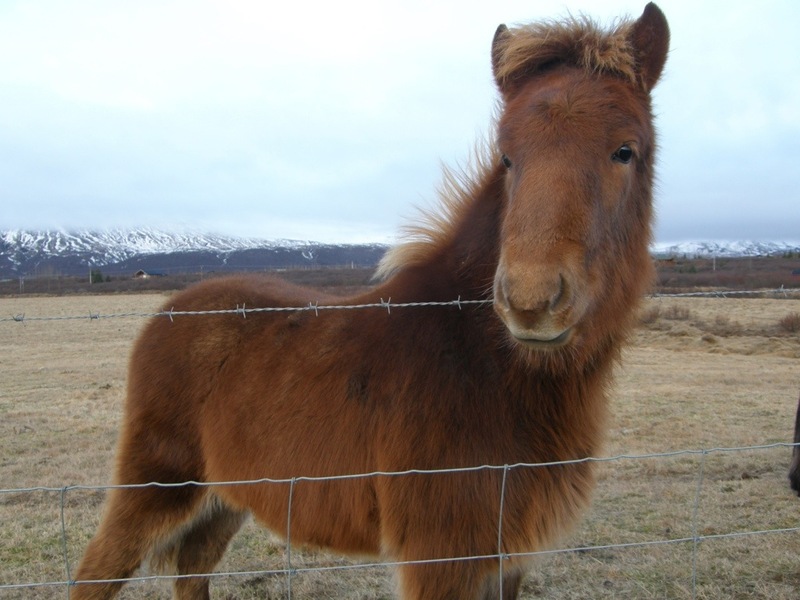 If an Icelandic horse is ever exported, it will never be allowed back into Iceland. The Icelandic people use this horse for both work and leisure. Many Icelanders own a horse and ride them daily. As I mentioned in an earlier post, they also use the horse as a food source. 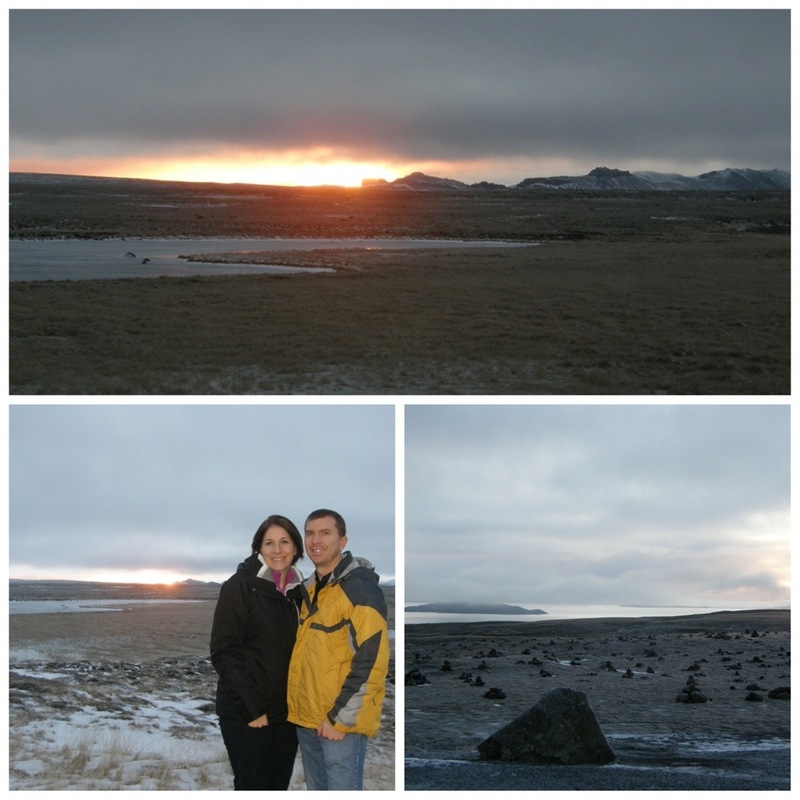 Our first “official” stop along the Golden Circle should have been Thingvellir National Park. Thingvellir was home to the very first parliament in the world. In 930, Vikings held annual parliament meetings around a rock formation to amend laws and create new ones. Thingvellir is also one of the few places in the world where the Mid-Atlantic Ridge comes above water, and is also home to a huge geological rift between the Eurasian and North American tectonic plates. I am sure all of these things would have made for some great photos, but unfortunately, due to some language misunderstandings, Rob and I did not stop. Oops! I guess this gives me another reason to go back to Iceland! 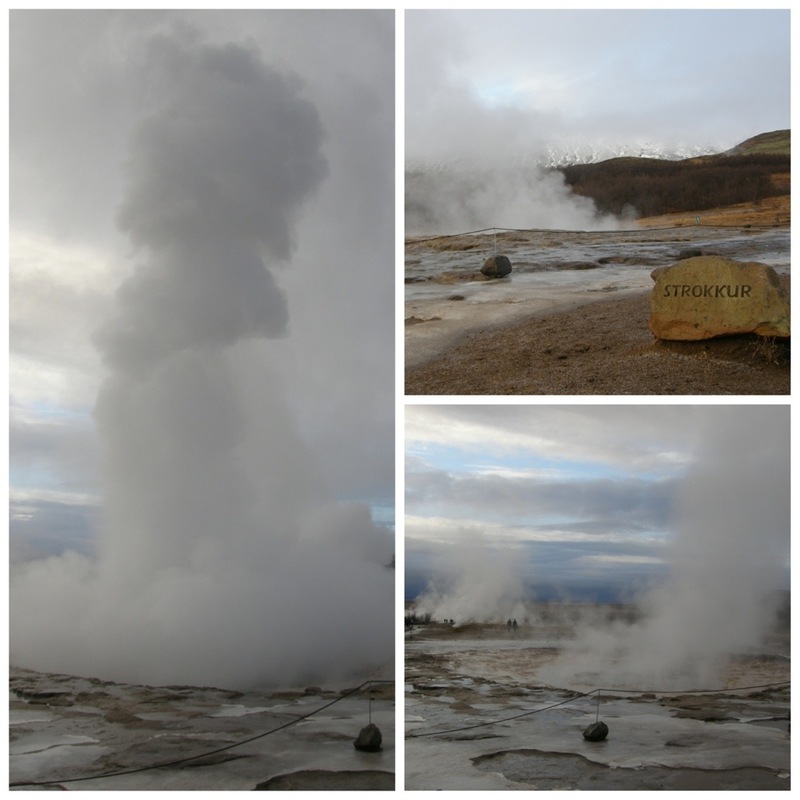 We made our way through the Haukadalur valley and stopped to see the active geysers in action. Geysir is the most well-known geyser in Iceland and it is also where the English word geyser derived from. Geysir used to be one of the most active and “reliable” geysers in Iceland. 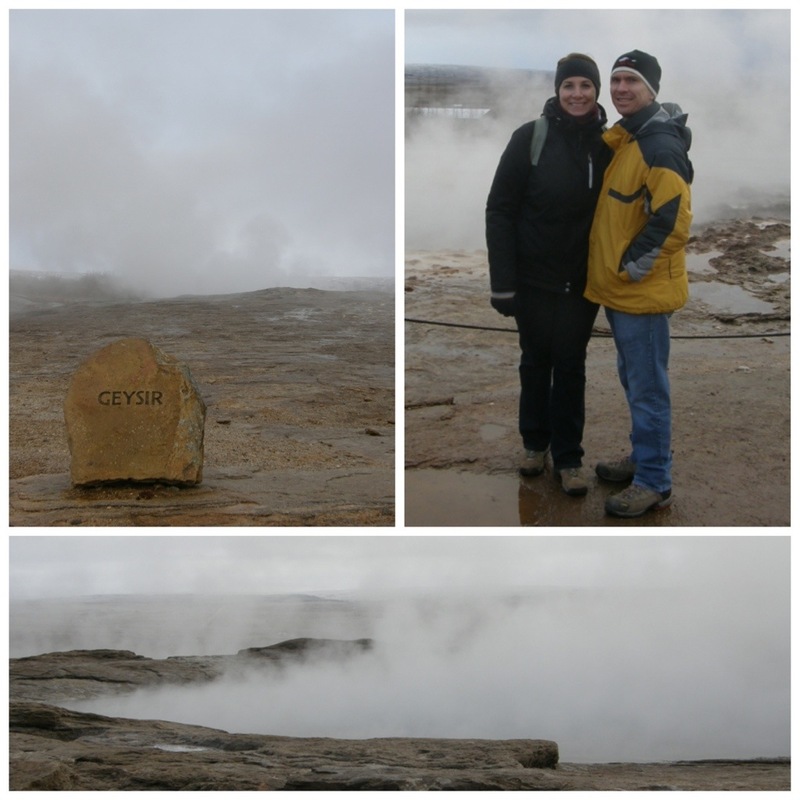 Unfortunately, Geysir doesn’t erupt like it once did due tourists throwing rocks into it in an attempt to set it off. Although it once erupted several times an hour like clockwork, it can now go several years without erupting. Luckily for us, Strokkur has stepped up to the plate. Strokkur erupts about every 10 minutes and it was absolutely fascinating to watch. Rob and I definitely stayed much longer than anticipated, but we just couldn’t get enough. I think we must have stayed long enough to watch it erupt about 15 times! 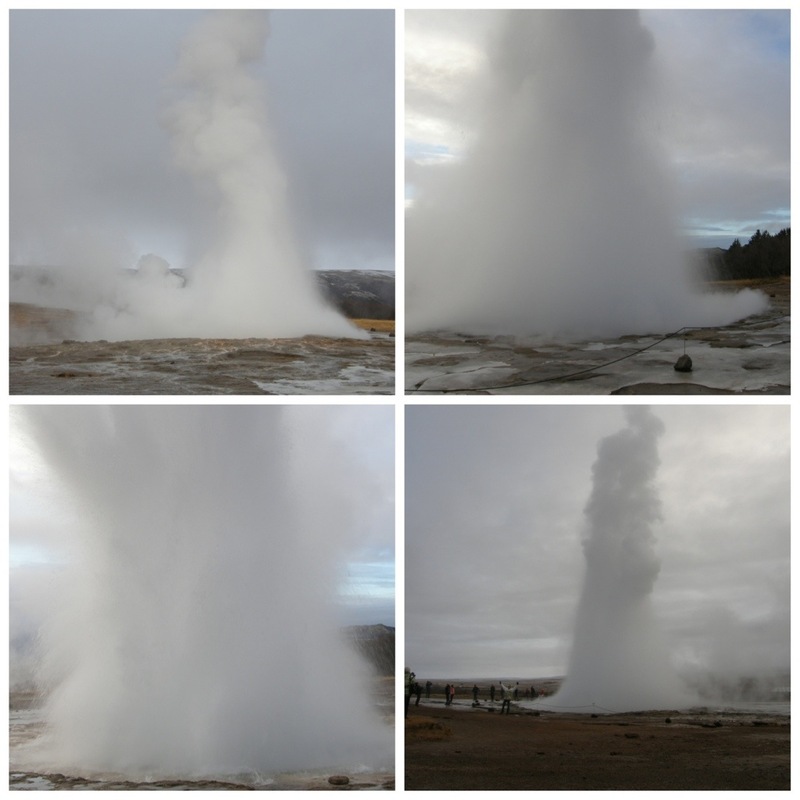 To get the full effect, check out these videos we got of Strokkur erupting! Satisfied with our photos and video, we stopped at the Geysir tourist center for lunch where I had more of the delicious meat soup. After interacting with the cute Icelandic horses earlier that morning, I was once again telling myself it was lamb soup. 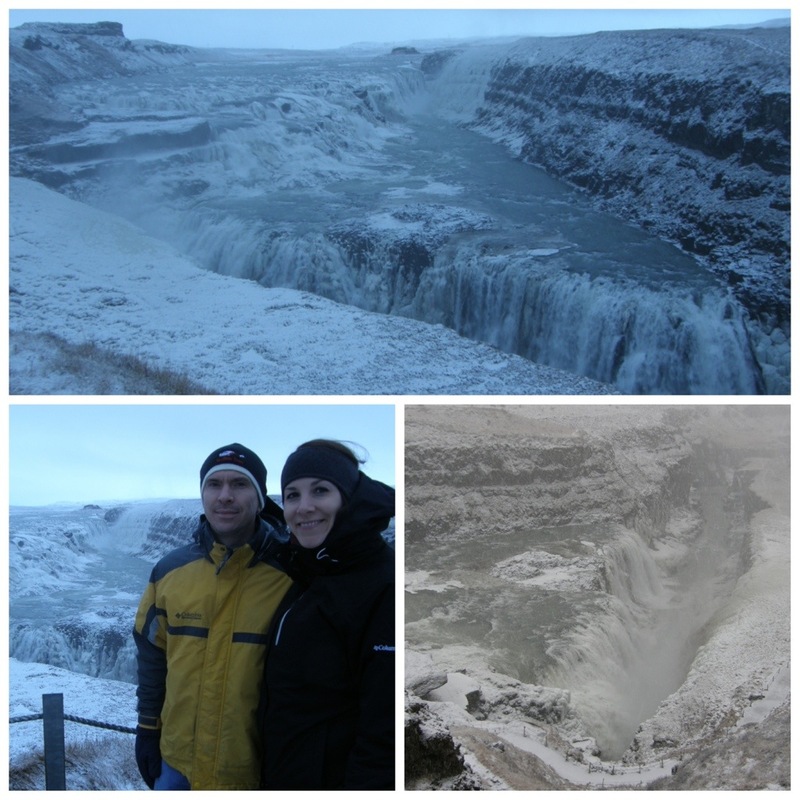 Then we set off to check out Gullfoss, the most famous waterfall in Iceland. The weather had taken a turn and it had started to snow, but we were undeterred. Gullfoss is a double tiered waterfall that is known for casting beautiful rainbows. Our pictures are much more dreary than other pictures I have seen of this postcard-perfect waterfall, but I was still thriving on my geyser high, so it didn’t get me down. Although, I am sure Gullfoss would be absolutely breathtaking in the summertime. Oh wait…what’s that? 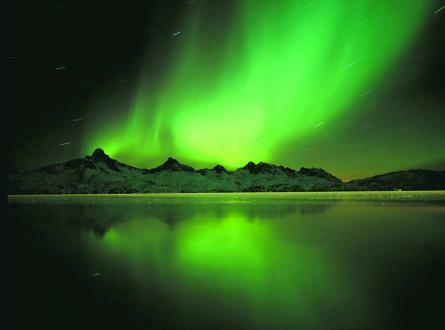 Another reason to go back to Iceland! Posted on November 28, 2012 by Dayna B. 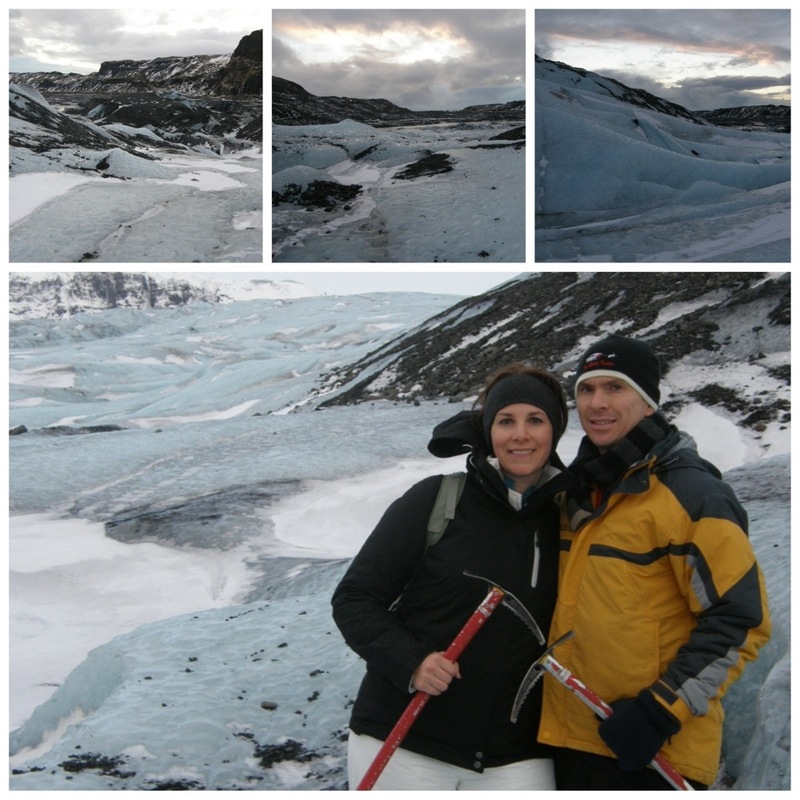 On Thanksgiving Day, Rob and I, along with our friends Heather and Patrick, embarked on a full day tour that included a glacier walk and hunt for the Northern Lights. We headed south towards Mýrdalsjökull, Iceland‘s fourth largest glacier. Mýrdalsjökull is just east of Eyjafjallajökull, the world famous volcano that erupted in April 2010. 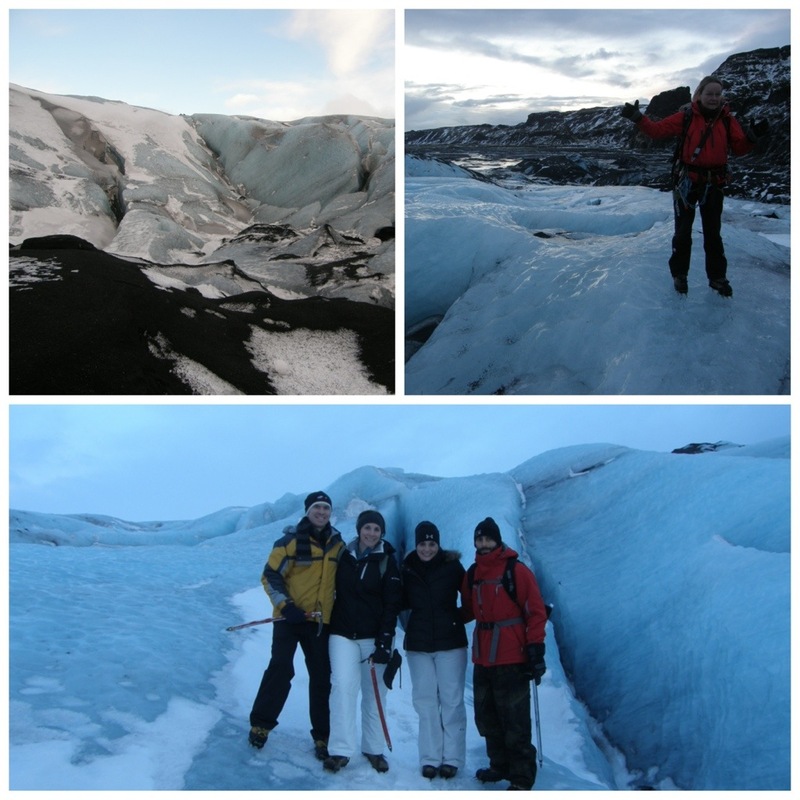 Along the way, our tour guide Anna, educated us on “all things Iceland.” A couple hours later we arrived at Sólheimajökull, which is a glacial tongue of the main glacier Mýrdalsjökull. It was an amazing sight with the ice so breathtakingly blue! This glacial tongue is a safe and easy way for novices to explore glacier features, such as cauldrons, crevasses and waterways. 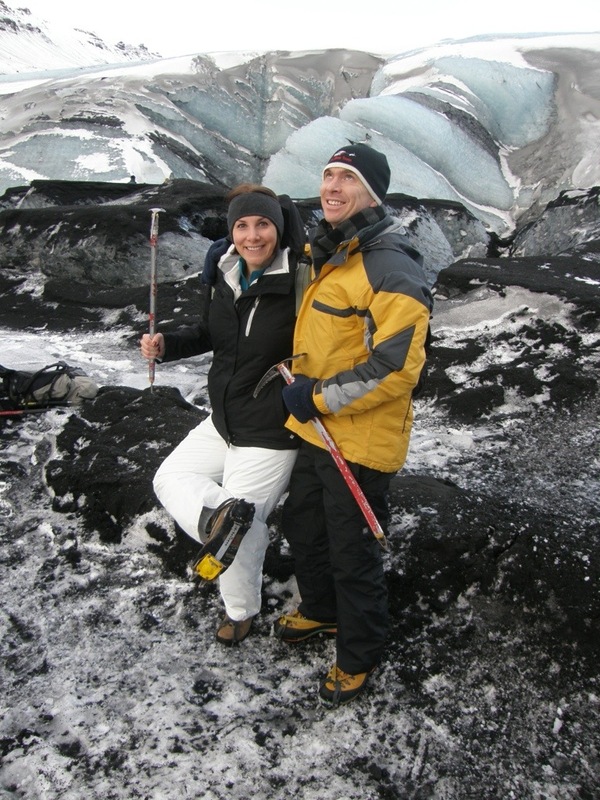 As soon as we arrived, we put on our crampons and we were each given an ice axe. Rob is quite experienced with this type of equipment, but it was definitely a first for me (hence me showing off my new kicks)! 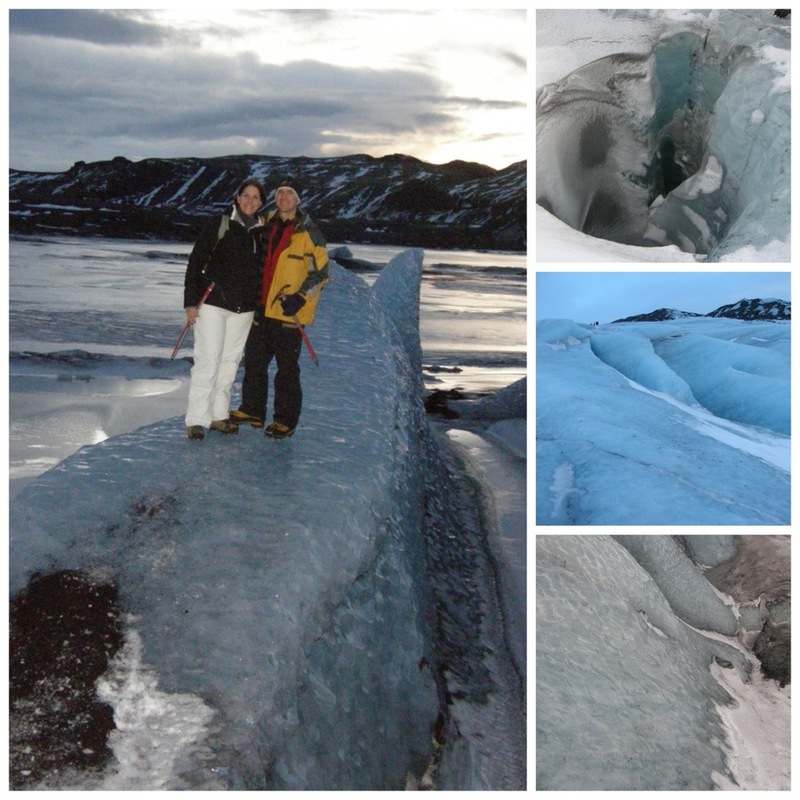 Anna provided us expert instruction on how to safely navigate the glacier. Fortunately, the weather was absolutely perfect. It wasn‘t too cold and there was virtually no wind. 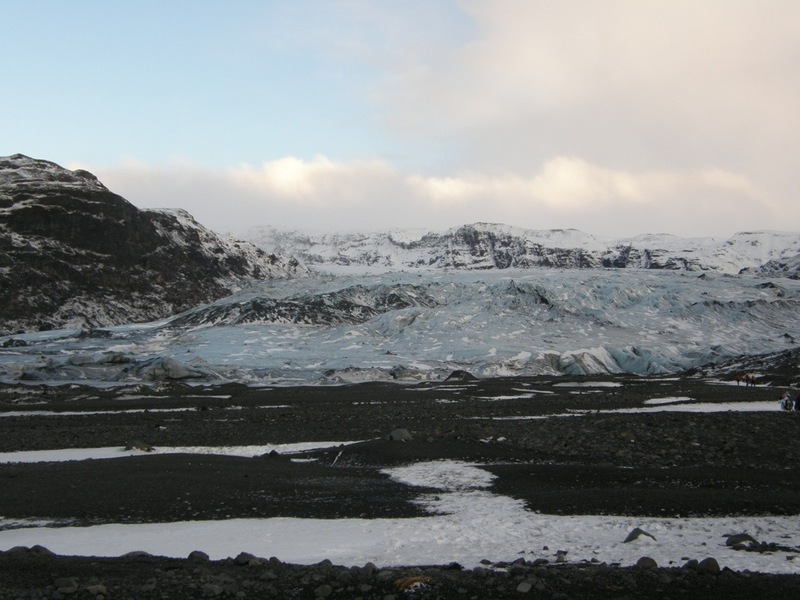 But most importantly, the glacier‘s surface wasn‘t covered in snow. This meant we could walk around without poking the ground below us with our ice axes prior to each and every step. When the glacier is covered with snow, you must use your axe to prod the ice to ensure you will be stepping on solid ground. If you don‘t, you might plummet to your death! We had a few “special” tourists in our group that weren’t heeding Anna’s instructions. Fitting for Thanksgiving Day, I guess they should be thankful they didn’t plummet to their death. 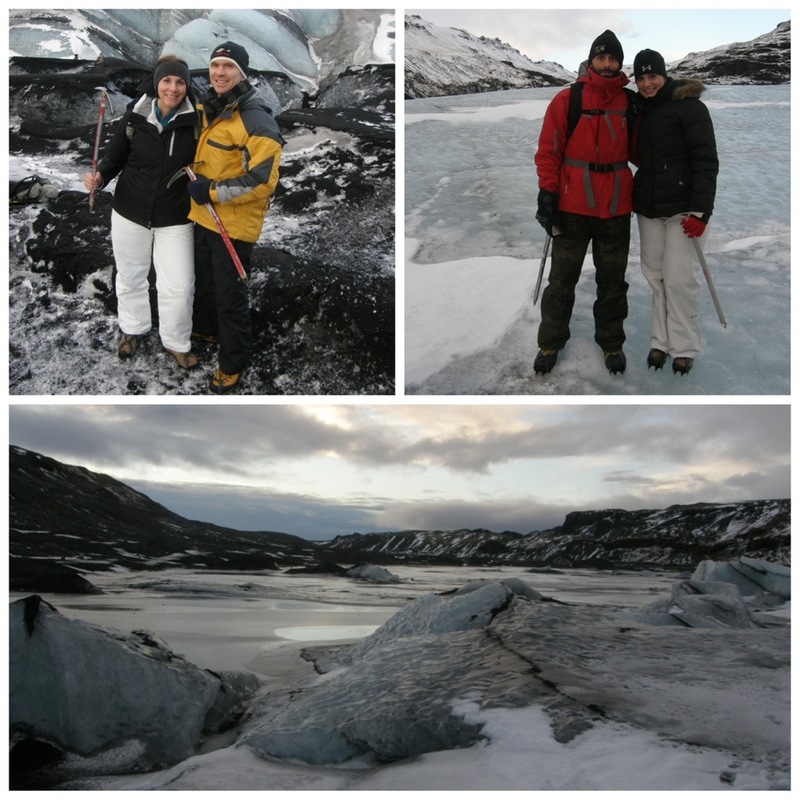 After spending a couple hours on the glacier, it was time to make our way back to the bus before the sun went down. I was feeling pretty confident with my new glacier skills, but I wasn’t really up for testing them after dark. Before dinner, we stopped at 2 waterfalls and then the Eyjafjallajökull eruption center. We watched an interesting video that showed how the eruption affected a family farm at the base of the volcano and their journey rebuilding their farm. I must say…the Icelandic people are pretty brave to build (and then re-build) their homes adjacent to active volcanoes! 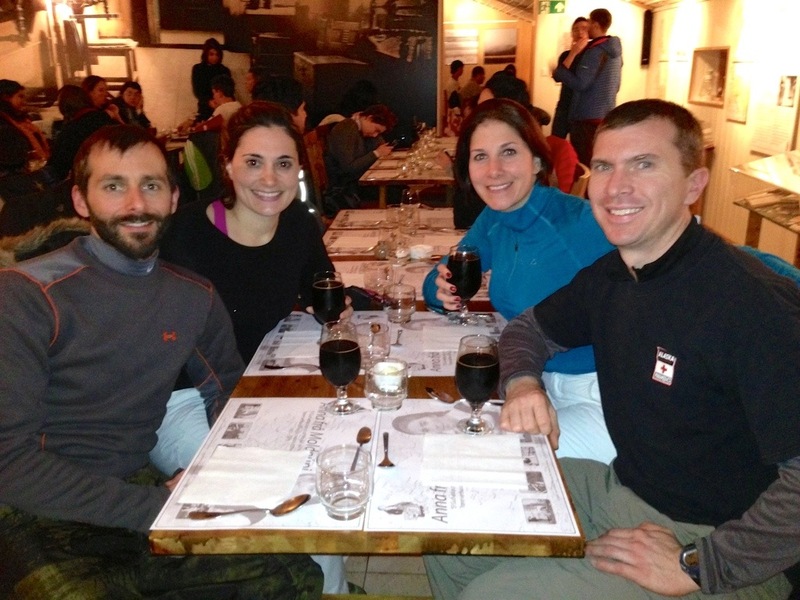 Our next stop was Hotel Anna, where we enjoyed a delicious meal and tasty Lava Beer. This Thanksgiving, we enjoyed Icelandic Meat Soup instead of a traditional American turkey dinner. I ate their meat soup a lot during this trip and I have to say that Icelanders have this recipe down pat! It was SO good and none of us could resist going back for seconds. The only question was “What kind of meat is in the meat soup?” We told ourselves it was lamb, but the truth is we will never know. It could have just as easily been Icelandic horse, since that is a part of the Icelandic diet. I think I’m going to just continue believing that I was enjoying lamb soup. After dinner, it was time to search for the Northern Lights. Unfortunately, it was an incredibly cloudy night, so our chances of seeing them were not great. I held on to hope though because this was the part of the trip that I was most excited about. In my mind, I had visions of this spectacular show in the sky and I couldn’t wait to see it for myself. I was convinced that the clouds were going to part just so that I could experience this amazing phenomenon. And then I got a heavy dose of reality check. 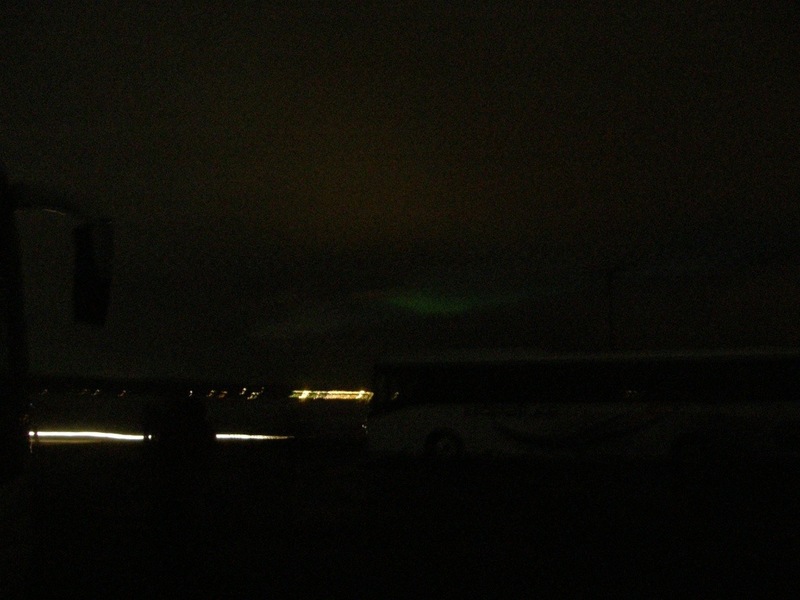 The picture below is the extent of my Northern Lights experience. They weren’t incredibly active that night, but they were definitely there. Unfortunately, so were the clouds. With such high expectations, this was definitely the most underwhelming outcome. Note the small green streak. Posted on November 27, 2012 by Dayna B. Rob and I had an overnight flight to Iceland and we were luckily able to check-in at our hotel first thing in the morning. 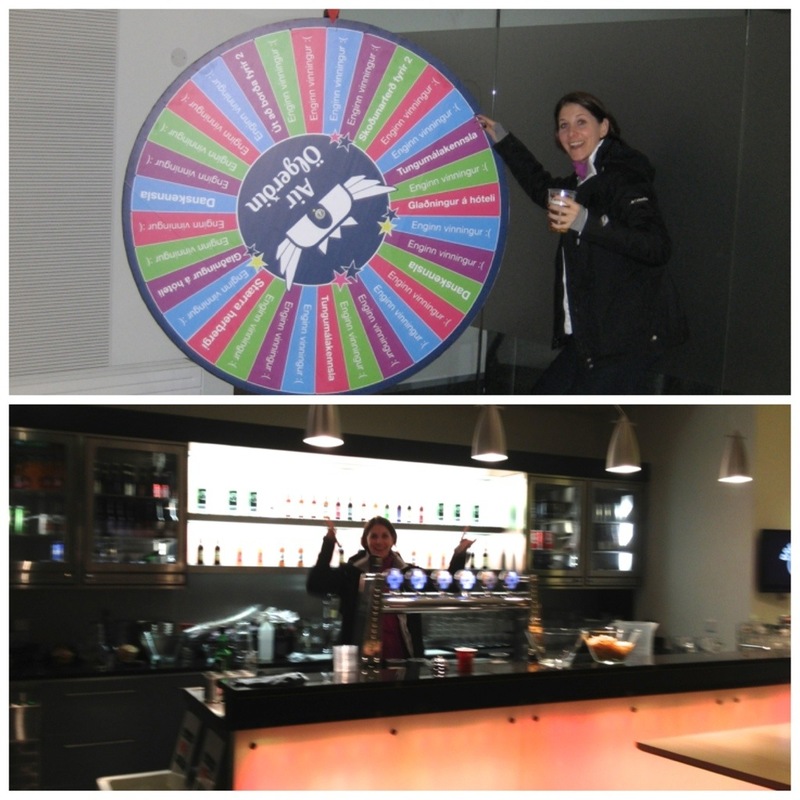 We arrived at the Icelandair Hotel Reykjavik Natura at about 8 a.m. and I was pleasantly surprised that we were able to check-in that early. As much as I wanted to get out there and start exploring Reykjavik, Rob and I both agreed that we needed to nap before we tackled touring the city. After sleeping a bit longer than anticipated, we ventured into the city. It was a very windy day and therefore, it was quite cold. I was desperately wishing that I would have worn my thermal leggings under my jeans, but I was certain that I wouldn’t make that mistake again during the rest of our trip! 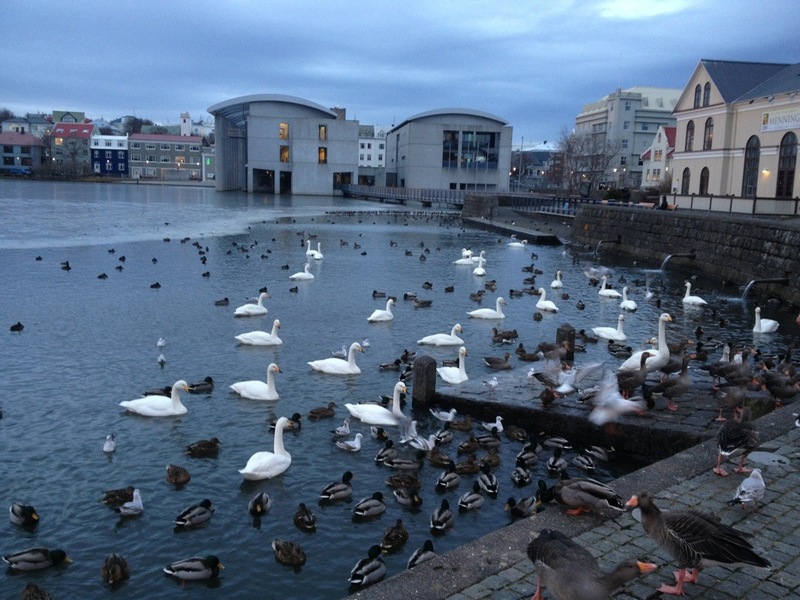 My favorite spot in Reykjavik was Tjornin, which is a small lake in the city center. The lake was completely frozen except for one small area where they pump geothermal water into the lake to make a spot for the local water birds year-round. Rob walked straight out onto the ice, but I was a bit more hesitant to do so. After a few minutes of contemplation, I was convinced that the ice was thick enough, so I joined Rob in the middle of the lake for a photo op. The Hallgrímskirkja is the largest church in Iceland and it is named after an Icelandic poet and clergyman. In all of my travels, I have never seen a church that looks quite like this one. The design is said to resemble the basalt lava flows of Iceland’s landscape. 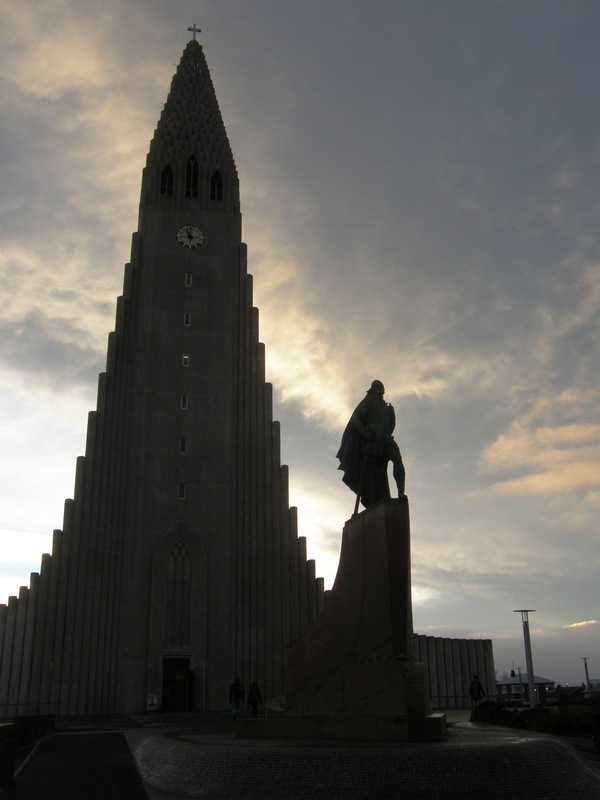 The statue in front of the church is of Leif Eriksson and it was actually a gift from the United States to commemorate the 1000th anniversary of Iceland’s parliament. All of this exploring made us thirsty, so it was time to taste the local beer. 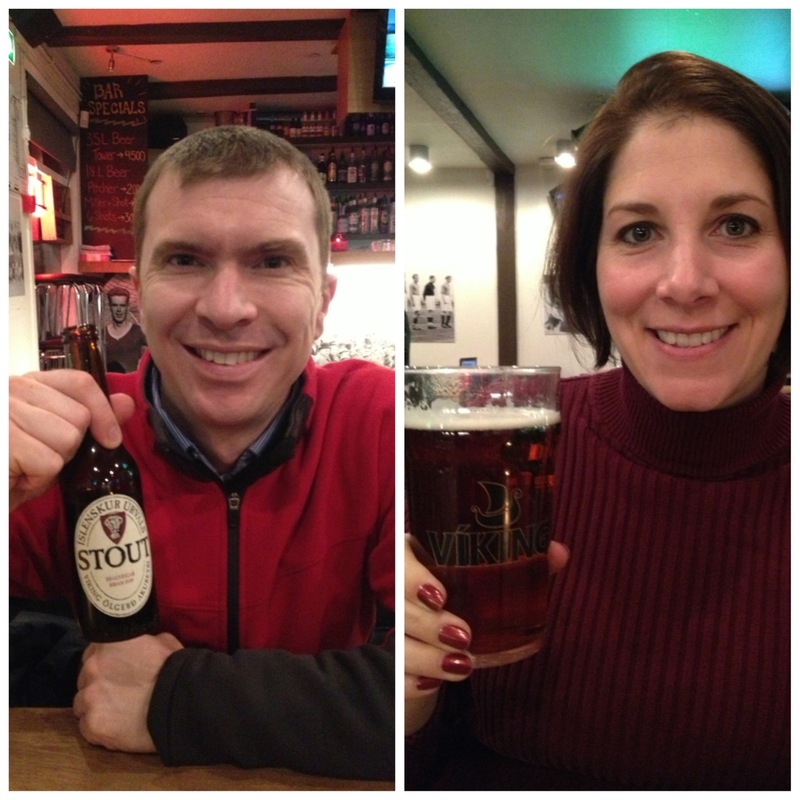 We stopped at a bar and I enjoyed a delicious seasonal Viking Christmas brew, while Rob drank an Icelandic stout. Both were quite good! After trying the local drinks, we were ready to try the local food as well (at least I thought we were ready). Rob asked our waitress about Icelandic specialties and she recommended he try the appetizer sampler (pictured below). 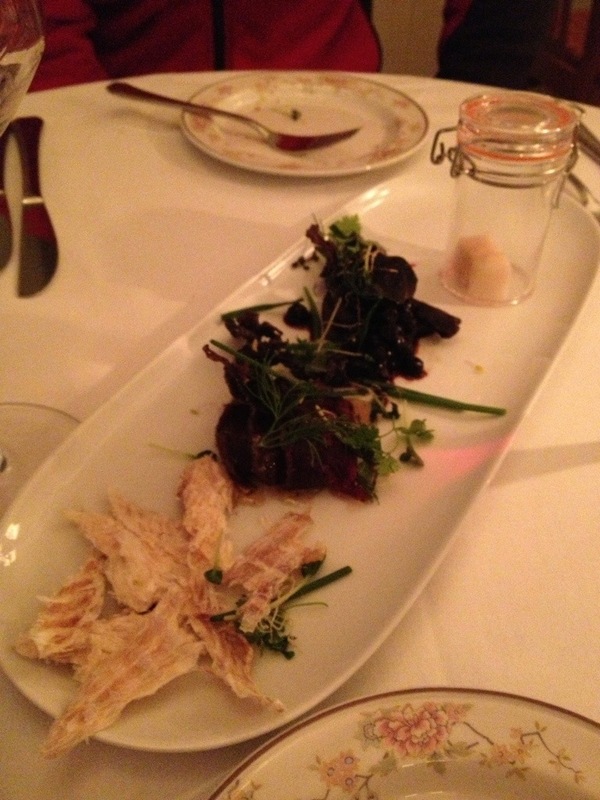 From left to right: Dried Fish, Minke Whale, Puffin, & last, but certainly not least….Rotten Shark! Thankfully our entrees were both quite delicious. I had the Icelandic Cod and it was the best I had ever had. Rob tried a freshwater fish called Arctic Char and he said it was the best fish he had ever eaten. 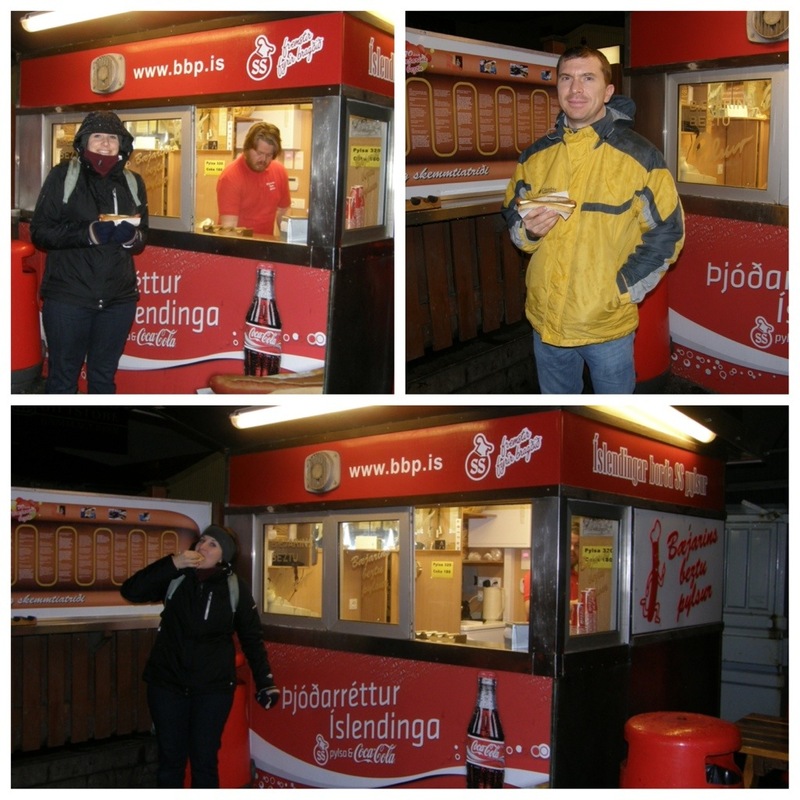 With specialties like Dried Fish and Rotten Shark, it’s no wonder Reykjavik’s most popular restaurant is this hot dog stand! 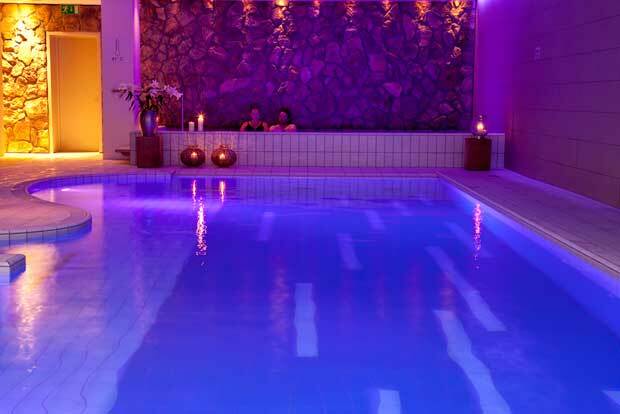 After an exciting and freezing evening in Reykjavik, the perfect way to end the night was to relax at our hotel spa. This was definitely the best way to warm up my chilled bones. Posted on November 6, 2012 by Dayna B. 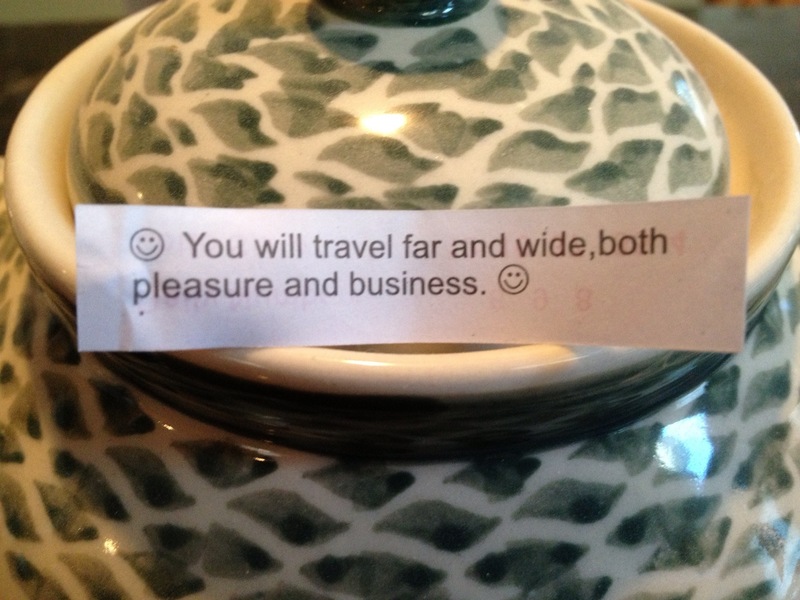 Either way…we leave for Iceland in just two short weeks!